Here is a Windows 8 tutorial on how to view file extensions and open hidden files in Windows 8. 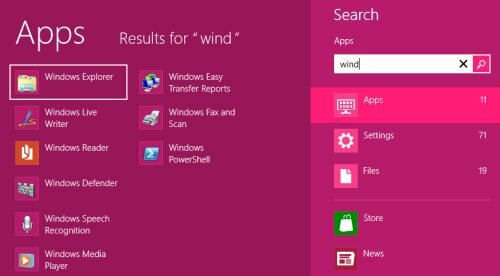 Yupp…unlike previous versions of Windows where you had to take heavy pain to show file extensions and hidden files, Microsoft has luckily made it simple to view file extensions and hidden files in Windows 8 OS, the newly built Microsoft’s OS. Lets me quickly go down directly towards the tutorial to open hidden files in Windows 8 below without wasting time on not so important talks. Press Windows Keys and search for “Windows Explorer”. Click on it once found. Now click on “View” given in the navigation tab bar. At the right side of the screen will a “show/Hide panel wherein you will find “File Name Extension”. Just check this “File Name Extensions” box to view the file extensions. And, to view hidden files, check the “Hidden Items” box. 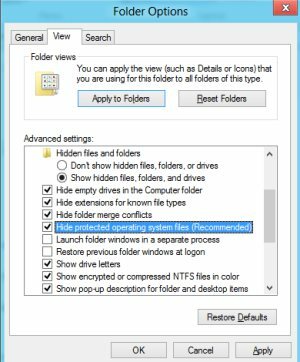 However, you need to notice that enabling hidden items to show using “Windows Explorer” will never show the OS hidden files. If you want to show all the hidden files on your system, just click on “Options” given at the right side in the navigation bar. Now, click on “Change Folder and Search options”. Scroll down and look for “Hide Protected Operating system File” and uncheck this box. You will instantly get a warning that its unsafe to uncheck this box. Click on “Yes” if you want to continue.